Dr. Marcy Van Buren stands out amongst our other breeders. She does not have a background in genetics, a laboratory, or even a basic biology textbook. Her PhD is in plum farming! However, Marcy’s passion for cockatoos led her critter into the finals. Ever since a trip to Australia, Van Buren has obsessed over the cockatoo. Owning fifteen at a time, she immersed herself in cockatoo culture. Her home resembles a rain forest; fake trees, jungle murals, and enough fruit to feed fifteen birds can be seen around every corner. A decade ago a good friend introduced Van Buren to the Jacobin Pigeon, and Van Buren was instantly inspired to create a cockatoo sporting the Jacobin Pigeon’s hood. For years the Jacobin Cockatoo remained a figment of Van Buren’s imagination, however once she heard of The Cultivated Critter’s competition Van Buren sprung into action. In her interview Van Buren stated, “A wave of excitement shook my body. The Cultivated Critter provided me with the opportunity to create the cockatoo I have been dreaming about! I had to go for it. I may not have known what I was doing… I still don’t, but I couldn’t pass up the chance to create something special”. Van Buren purchased a basic transgenic kit, and got to work in her shed. She began by breeding a Jacobin Pigeon with a Sulfur-Crested Cockatoo, however since they are different species this did not work. Van Buren decided to open the transgenic kit, and acquired DNA samples from a Jacobin Pigeon. After months of trial and error, she managed to extract the gene that creates the Jacobin Pigeon’s hood. Once a significant supply of this gene was collected, Van Buren injected the gene into developing eggs of Sulfur-Crested and Citron-Crested Cockatoos. The first batches shortly perished, and did not gain the traits of the Jacobin Pigeon. Eventually, Van Buren was able to inject the Jacobin Pigeon’s gene at the appropriate stage of development, and the Jacobin Cockatoo was born. The Jacobin Cockatoo is a moderately easy bird to care for. It requires the same amount of attention as an ordinary cockatoo, and has a similar diet. You can purchase the Jacobin Cockatoo with a sulfur or citron crest. Since the Jacobin Cockatoo is a new creation we are not aware of its longevity. Yet, it can be assumed that the bird lives for at least five years. Be weary of the Jacobin Cockatoo’s hood. While fashionable, it inhibits the bird’s ability to fly, and may cause discomfort and bacterial infection. The bird should be regulatory checked for infections, and placed in a comfortable setting to prevent stress. The hood can affect the bird’s vision, and your Jacobin Cockatoo may appear clumsy. Do not attempt to breed the Jacobin Cockatoo. The DNA that provides the bird with its hood is still volatile, and will mutate in the second generation. Remember, nobody likes an ugly cockatoo. Only purchase Jacobin Cockatoos from The Cultivated Critter or reputable breeders. 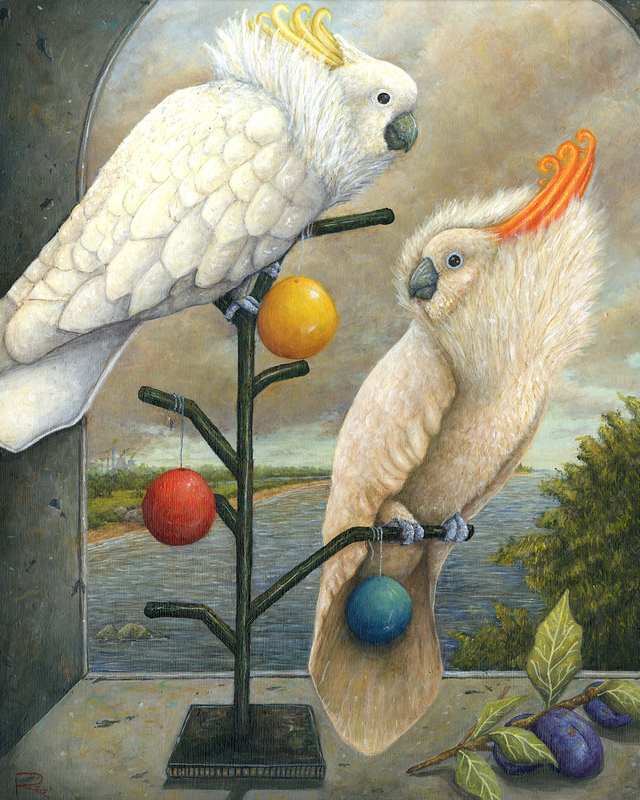 In conclusion, the Jacobin Cockatoo is an imaginative twist on a common bird, and is a pleasure to keep around the house. My third of four senior thesis pieces, dealing with genetic modification for the purpose of pets. In my thesis, the fictional organization The Cultivated Critter has organized a competition to see who can create the next hottest pet on the market. Many applied but only four finalist were selected. Consumers may vote on which critter they would like to see in their homes, thus deciding the winner of The Cultivated Critter's competition. The winner will receive $100,000, a grant to mass produce the animal, as well as 1% royalties on every animal sold. Runner-ups will receive $1,000, and a complimentary The Cultivated Critter t-shirt. The Jacobin Pigeons was the third finalist selected.